Elegant appointments with dual humbuckers and vibrato tailpiece. Featuring Guild’s iconic double-cutaway Starfire body shape, the Starfire VI has stunning AAA flamed maple top, back, and sides, and a solid centerblock. Dual LB-1 Little Bucker pickups, replicas of Guild’s 1960s smaller size humbucking pickups, offer a range of tones well-suited for a variety of playing styles and genres. The Starfire VI has a three-piece maple/walnut/maple neck and a bound rosewood fingerboard inlaid with mother-of-pearl and abalone V-blocks. It also features a pinned Tune-o-Matic bridge with rosewood base, rosewood bridge, and comes adorned with gold hardware, 5 ply black and ivory purfling, deluxe f-hole and body binding, and a Guild Vibrato Tailpiece. 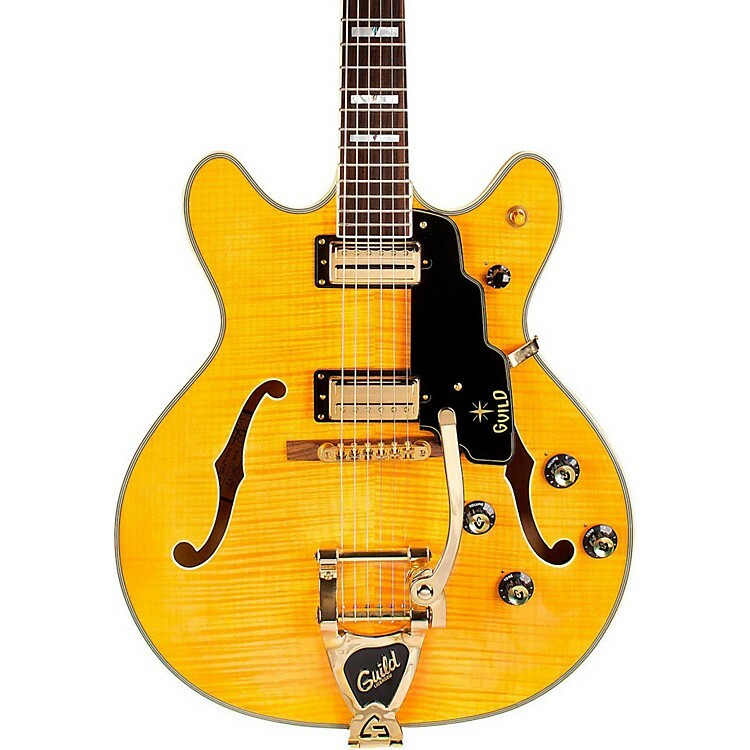 It’s available in a high gloss blonde finish, and includes a hardshell case. Guild’s most deluxe Starfire on the market, the VI has the vintage look, tone, and feel that you can only get from a Guild Starfire. Includes hardshell case. Join the Guild of great players. Order today.